New 12 gpm pump and electric clutch. Will sell separately, call for more details. FOR SALE. STARTER TO FIT JOHNSON OR EVINRUDE OUTBOARD ENGINES. 45 pound thrust foot controlled trolling motor.speed and direction are controlled by your foot. This trolling motor attaches to the bow of your boat . In perfect working condition.Came off a boat I bought from the states. ELECTRIC START/+PULL CORD STARTER/REMOTE CONTROL BOX SIDE MOUNT. ALL THE MOTOR PARTS ARE IN EXCELLENT CONDITION. PARTS ARE AVAILABLE AS LONG AS AD IS POSTED. 1 starter,alternater,fuel pump,heat exchange and aftercooler rad. Willing to sell parts separately. 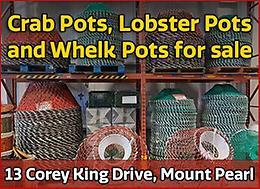 Seining Leads for sale. $1.50 per pound. To buy these new they are $3.50 per pound. Call for more information. Look for a double axel boat trailer.